So I don't have the right copepods right now but I have a pair of blue stripe pipefish that has laid eggs. My catalinas are throwing babies. The cuttlefish are 6 weeks old. I have a baby trochus snail that I'm pretty sure was born in my tank. And I've sold several of the seahorse babies making room for the younger ones behind them. Can't wait until I get a better handle on work so I can try starting up some parvocalanus copepods. I have trouble with the T-Iso. I have some apex pods I can send you. They’re small like Parvo but more prolific. I’ve been using them. I have a pdf that I thought I sent you but I can send again. Have a brand new batch of blennies, which I’m raising while wainiying for my other pairs spawn. Would like to trade some of my juveniles for some of yours. BTW, the nauplii for apocyclopse Panamensis is easy to harvest. I’ve made my own passive copepod harvester. It works beautifully. Why don’t you ever post pics or video so we can all see your progress and all the successes you’ve been talking about. I would love to see a pipefish brooding, as I’ve not seen. I was looking at breeding them but they’re hard to sell. Too much live foods to keep and crashes happen often. Post some pics! Pdisner what babies did you want to trade? or are you talking trading Copepods? Mainly I don't post pictures for the same reason I don't have parvo's right now. I just don't have time. I'm spending 1 hour a day on fish chores. I'm working 12 hours a day for my job, and have other things to do. Also this site doesn't really let you sell your fish so .... I do spend time when I have it posting on MBI where I can share my experience with other breeders and get help from them. Here's a shot of my male with eggs. They are kinda hard to see. Because I let my breeders live in a normal / messy tank with plants and rocks and such getting pictures can be difficult. Hint he is swimming under a ledge so his belly is up. It is the rough bumpy patch on top. RIP the female though so that is the end of that. link to my seahorse babies. But the first went farther for longer. They all have picture in them. I haven't done a thread yet for the cuttlefish cause they are mainly my hubbies project and haven't had time yet. I think he has a thread on a different forum. I have to go to bed now 11:15 here and I have to get up early and go shrimp hunting tomorrow cause his three cuttlefish who are about 2 months old go through 6 grass shrimp a day or more. Then I have to revise a Calculus test on related rates and optimization. Then I have to siphon my main tank and see if I can get rid of the cyno I've gotten since i vaccuumed my sand. Then I have to decapsulate some brine shrimp for the seahorse babies and the juvenile pipefish and the new male mandarin I just got to pair up with my female. He came home today from the store and I have to wean him onto frozen food. make some sterile water for the motile algae I'm trying to establish so that I can safely order parvocalanus. strain brine shrimp and restart to feed the fish x2. Do laundry, dishes, lesson plan for geometry and calculus for Monday. The list is just too long right now. But to add to the excitement. My LFS got some WC seahorses in that were really cool looking they were large and knobby kinda looked like minature alligators. I won't buy WC horses but he did catch me some babies so I have some fresh genetics to add to my F2 generation or is that F1? I do have some pregnant babies (they are at least 6 months old) so soon babies will be having babies. Eventually I'll need to look into wholesale or something. Here's a video of the baby cuttlefish eating their shrimp (hint it's boring until near the end). Well the blue pipe had babies 10/30 and I think he'll be releasing tonight. I haven't caught any babies I am just noticing when the eggs get big /disappear and new eggs appear. I 'm trying to figure out the schedule so I'll know what day I need to try to catch babies. I really need to break down and try to get a larva catcher. But until I get a better copepod breeding going it doesn't really matter. My baby seahorses are now sexually mature and I have my second batch of babies. The first batch was really small and didn't do well in the tank until I arrived to fetch them out but the second batch I caught and they are doing ok. The low temps have caused some die off because their 'tank' doesn't have a heater or heat bath. The male mandarin is being mean to my girl. I hope it is a food competition thing that will settle out when he figures out mysid is food. He is being stubborn and not eating mysid, only live food right now. I'm hoping he'll figure it out before he starves. i have a brine feeder in there and I'm dosing tigger pods and amphipods but that tank has a lot of competition for live food and he's a big boy who needs lots of food. He was skinny when I got him like most mandarins at a store. But he made it through the hurricane and no power so hopefully he'll continue to make it til he eats. but if he doesn't stop the dickish behavior he can go back to the store since females are harder to find than males. My dragonface pipefish are rocking along but no eggs. I have one who has made moves on another but the other doesn't seem interested. I'm not sure they are all the same species since dragonface has 12 subspecies that all get the label dragonface. Yeah. First milestone. I've sold all but 2 of the largest babies and most of the mediums babies. I had my first break the grow out system completely down and set it back up for a change over. I've moved my babies who are weaned into the tank. 129 little ones make that tank look so large LOL. Once I put the chaeto back in they'll all disappear and I won't be able to see them. The 2 large ones are cream/tan boys. One if not both are holding so I'll have babies of babies (of course I already have some of them). I felt fortunate to get rid of most before the Thanksgiving to Christmas shipping time. I would love to ship out the last two but I don't think I will ship after Thanksgiving. My local shop sell them too so maybe I will just cycle them through there. So for Thanksgiving my LFS is changing one of his large display tanks out. He has a very large Banggai pair in there. The male is always holding but LFS can never catch the babies he thinks she makes him spit them out before they are done. He's going to catch the breeders and sell them to me. I used to have and raise Banggai (not that many) so I can't wait to try them again. I have way too many cultures and such to not have more babies!!! Plus Banggai babies are easy and soooo cute. Just have to get his male to hold and stop her from harassing him. Parvo copepods arrived today. Hoping to build the numbers and try bluestripe pipefish at Christmas before my iso or parvo's crash again. My pair are throwing babies every 9-10 days. I haven't see the babies yet but he gets eggs they get big and bumpy then disappear. Takes a day or two and she give him more. Still weaning my male mandarin he's really stubborn. That's amazing! Do you ever sell any of the pistol shrimp young? My problem is I haven't managed to keep the shrimp alive. And catching them before they become food can be tricky too. I'd love to sell the young but my success right now are limited to fish. Still, those are some amazing achievements! So I'm closing up shop on Tuesday. I will not risk shipping during peak Christmas delivery. I don't know when will actually be safe to ship again. I will only have 9 small horses, 2 large males left. I mean other than my brood stock. I'm keeping a few dwarf erectus (4 inches) to see if they stay dwarf. Exciting one of my dwarf males has a tiny little pouch bump. I have seem him and the female dancing and such and he maintains a little bump. It is so tiny I'd be surprise if more than one baby fit in there. The smalles dwarf (2 inches) tried cutting in on the mating dance and she isn't young. It's a fun little side bit. 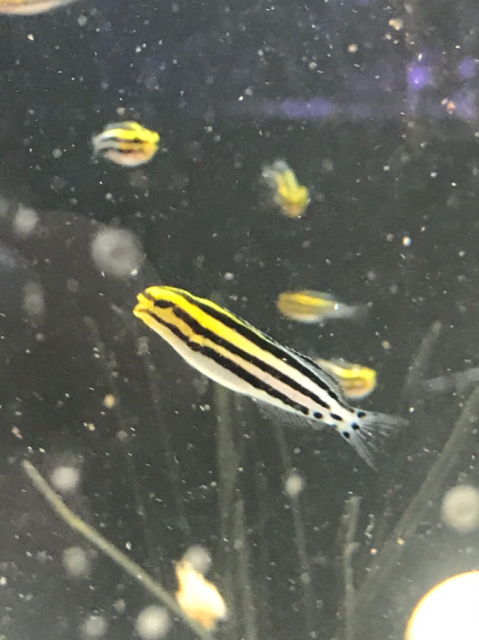 I finally have some parvos on hand so I hope to catch some of the blue stripe pipefish babies he's currently loaded up but not sure which day it is supposed to be. I am fighting to keep my iso going though. And I pray I can keep it all going until Christmas break because the next two weeks at school will be very busy. So I sold the last horses today which is great because tomorrow is the last ship day for a while. I missed catching the blue stripe pipefish babies but now 7-9 days should have more and that will be closer to break. i had to order more T-iso. Hopefully I can log in next week an start blathering about the pipefish babies. Not so exciting right now. My Barbouri arrived today and I think they sent me a very sick fish. Neither is eating. Both are breathing hard. and my boy looks like he has vibrio. So the Ocean Rider Barbouri's aren't quite what one would expect. I have found another source of Barbouri's and have ordered a pair for breeding. A bit more expensive but hopefully zebra snout and healthy. The boy "Barbouri" released some babies yesterday. They aren't as vigorous as the erectus babies. I think being in the medicine may have been too harsh for them. I have removed them to a larval tank and provided some copepods and baby brine shrimp. Hopefully some of them will be strong enough to recover and grow up big and strong. Pipefish ready to release and I think my parvo's have crashed. Great work with seahorses and pipefish. Too bad we can't get the pygmies from the Indo-Pacific.